Through a series of serendipitous events, this talented group of four friends came together in graduate school at Boston University and formed the Sons of Serendip quartet. They found fame on the nationwide television show America’s Got Talent. “Serendipity” may have brought them together, but now the Center of the Nation Concert Association is bringing them to the Belle Fourche Area Community Center on Sunday afternoon, May 12th at 3 o’clock. It's the final concert of our 2018-2019 season. Each member of this talented group has an inspiring story, and together the Sons of Serendip strive to embody the adjectives Classy, Genuine, Spiritual, Sensitive and Timeless. 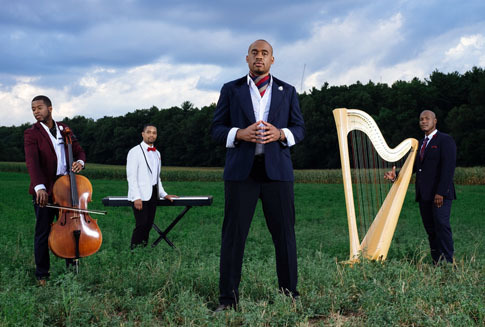 Tenor Micah Christian was a teacher; keyboardist Cordaro Rodriguez was an attorney; cellist Kendall Ramseur was a cello instructor; and harpist Mason Morton was also a teacher. In 2014 “serendipity” gave them the chance to perform on America’s Got Talent and they were finalists in the 9th season of the program. That launched their career! The Sons of Serendip program focuses on fairly contemporary music – some with a fresh twist, and others are familiar pop tunes from Motown. All selections will feature Micha’s beautiful tenor voice and the wonderful playing of Cordaro, Mason, and Kendall, who is also the backup singer. They offer an intriguing combination of voice and instruments, which produces a lovely, rich sound. They’ve been playing their instruments since childhood, but they came together just four years ago to begin what they know will be a long beautiful journey of creating music that touches people’s hearts. Sons of Serendip hope their singing will inspire others to follow their dreams, and work to spread love, and build a better world. On Sunday afternoon (3 pm) May 12th, the Sons of Serendip hope to create an experience you'll not soon forget! Sponsors for this final program of the Center of the Nation Concert Association 2018-2019 season include: Belle Fourche Beacon, First Interstate Bank, and Larry & Moggie Klipp. Let these sponsors know that you appreciate and enjoy our concerts.